The party is over! Everyone go home! Thank the FCC and Obama! So, Obama gets his latest notch in his socialist agenda. Now they set their sights on toll roads - so unfair to have some people be able to go faster than others just because they can afford it. Then it will be Frist Class airplane seats - so unfair to have some people be able to ride in comfort just because they can afford it. This act is pure socialism. Al Gore invented it, Obama trashed it. If you liked your internet, well you can't keep your internet. I have mixed feelings on this. Anything the government regulates screws US. The author of this piece is the biggest stooge and naive idiot on the planet. Government cannot ever, ever, ever, improve anything or protect anything. They only rule and control. This is the end of the internet as we have grown accustomed to. It IS a massive power grab by the FCC and we will suffer immensely for it. The FCC chairman Ajit Pai is a traitor who sold himself to the telecommunication companies like AT&T and Time Warner Cable. Before becoming FCC chairman, he was one of the staunchiest supporters of Net Neutrality. Then as soon as he became FCC chairman, he repealed Net Neutrality while insisting it will stimulate a freer open internet and the ISP will not charge the public to use faster lanes versus slower lanes. Someone needs to take a good look at the FCC chairman's bank accounts and see how much $ has been deposited into them by ISP using shell companies as fronts. 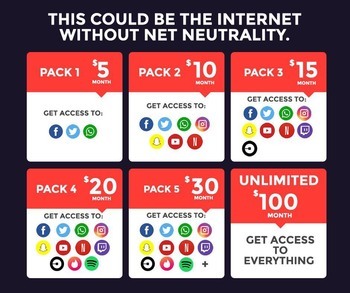 This means if you use NetFlix, your ISP may want to charge you extra $ to stream from NetFlix at your fastest available speed, extra $ on top of what you already are paying monthly for your internet service.